This comes out and sticks to their face like glue! While they are unable to see or breathe very well, you have time to get away. 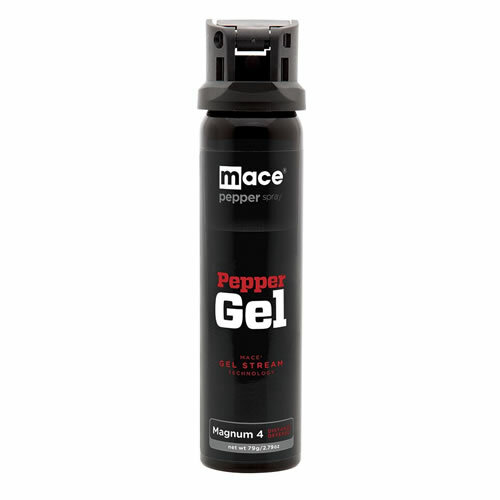 Mace Pepper Gel is an innovative formulation of OC pepper which is suspended in Gel instead of a liquid stream. This self defense spray from Mace comes out and sticks to the person in a gooey mess. The pepper gel slimes the attacker so they cannot easily wipe it off. The strong, super hot, pepper formula melts into their pores and getting into their eyes and nasal passageway. Ideal for auto, personal (walking, running, etc. ), or home use. 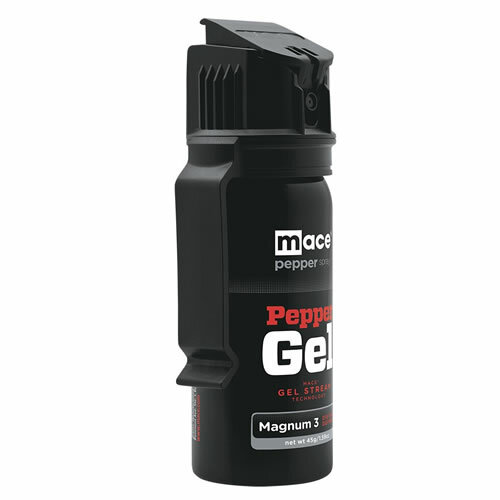 This new pepper gel formula is the newest and most ingenious product available in self-defense sprays. Features: Flip-top safety cap to prevent accidental spraying. In 2008, a new self-defense spray entered the market and though it's a tad more expensive than other sprays, it's also more effective and able to further increase your chances of protecting yourself against attacks. 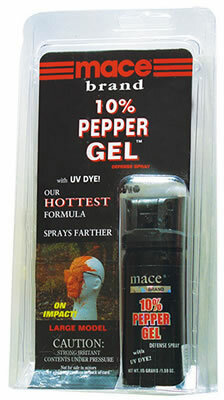 MACE Pepper gel contains the same formula used for pepper sprays and foams. Its main offensive ingredient is Oleoresin Capsicum (OC), a compound taken from cayenne pepper. The effectiveness of pepper compounds as a self-defense "weapon" is measured in Scoville Heat Units or SHU. A habanero pepper has 300,000 SHU. A jalapeno pepper merely has 5,000. Pepper sprays and gels, however, have approximately 2,000,000 SHU. These are just as easy to use as their predecessors. They come with flip-up tops. The lids are necessary for preventing accidental spraying. It's important to keep it concealed but easily accessible. This could be inside your pocket or snapped on to your jeans under your shirt. 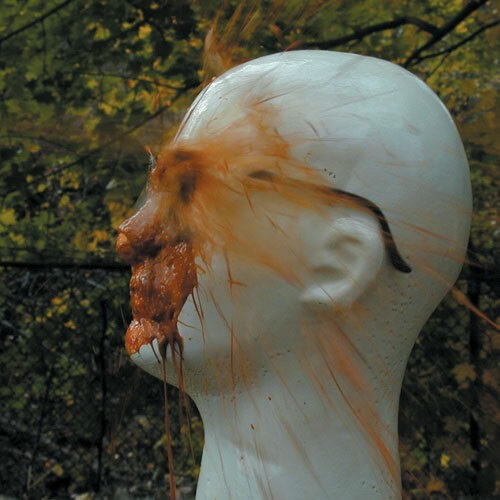 If you're under attack, all you have to do is flip up the lid, aim for the eyes or face, and squirt away! One spray will cause your attacker to experience shortness of breath. Temporary blindness may follow shortly after or occur concurrently. Last but certainly the least, your attacker will experience pain in the areas affected by the spray. Touching the liquid will only result to even more pain as it can cause a burning sensation on your attacker's hands. Consistency allows the advantages of this type of self defense weapon to be more powerful. Firstly, they have a greater range. While pepper sprays can only work in a range of six to twelve feet between you and your attacker, pepper gels can reach targets located as far as eighteen feet away. Two feet may not seem much at first glance, but when you're under attack, an additional two feet could give you the precious seconds you need to make a successful escape. Pepper gels also have a greater concentration of OC because of its semi-liquid form, making it even a more powerful self-defense weapon. Targeting your attacker is also made simpler. Unlike pepper sprays and foams, gels are unlikely to disseminate or lose power before it reaches its target. You'll find this product is easy to use even when your hands are shaking and you're about to go into a full-blown panic. Lastly, again because of its natural form, stays longer on the attacker's face and consequently prolonging his agony. Unlike spray or foam, this can't be easily wiped away and clings stubbornly to the skin. They're definitely the ideal self-defense weapon, able to give you the element of surprise "and the upper hand" in practically any fight. Use: For maximum effect and range, it is recommended to prepare Pepper Spray for immediate use with a few rapid shakes prior to taking aim and discharging at your attacker. Deploy Pepper Spray by using thumb or forefinger to depress trigger in short 2 to 3 second bursts, Pepper Spray can be quickly dispensed if the trigger is continuously depressed. Safety: Strong irritant, keep out of reach of children. Read instructions and first-aid directions included with your Pepper Spray prior to use. If accidentally exposed to Pepper Spray, remove contaminated contact lenses and clothing immediately, flush affected areas with plenty of cool water and expose to fresh air as soon as possible. Spray canisters are under pressure, do not puncture or incinerate. Storage: Store in cool dry areas away from heat, flame or strong sunlight. Do not store where the temperature may exceed 120°F/50°C such as an enclosed vehicle, which can cause spray canisters to leak from over pressurization and fail to function properly. Do not store in cold environments below 32°F/0°C, which can cause depressurization and the loss of effective range. I purchased these for the girls in our office, including myself to keep in our desk drawer. One entity of our business deals with truck drivers and the employee has to deal with some very irate drivers sometimes. I just felt she should have something to defend herself with in the event something does happen that's out of control.